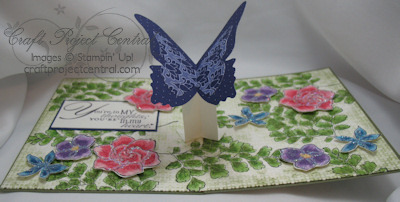 This is my second project for the June edition of Craft Project Central. I was feeling floral again! This cool technique will WOW anyone who gets it! To get the instructions, please subscribe to June at Craft Project Central. Just a reminder, if you missed past issues of Craft Project Central, you can still subscribe. Just visit www.craftprojectcentral.com and click on the month you want to subscribe to on the menu bar at the top of the page. Scroll down the page to a "subscribe" link under the last project picture (it will be in pink). Every month is $10 for 10 fabulous projects! Totally worth the price. This is just beautiful! I love the sparkle on the flowers and all of the colors. This is definitely a workshop WOW card!